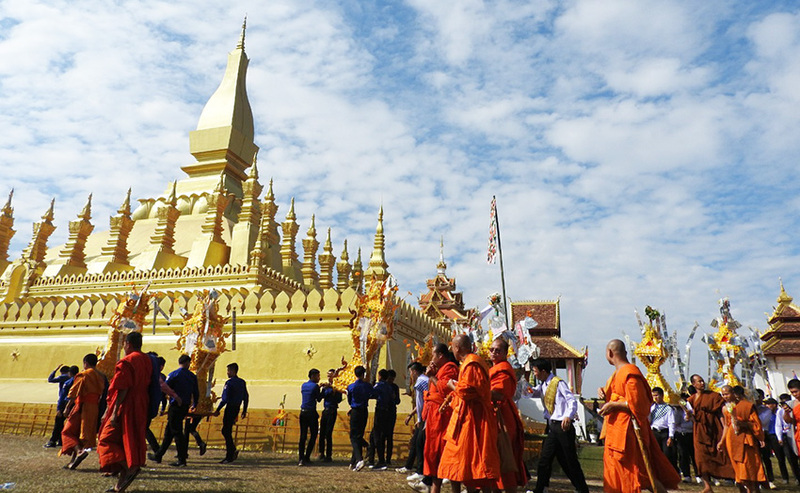 The Golden Stupa or Pha That Luang is the national symbol and most important religious monument in Laos and Vientiane’s most important Buddhist festival is Boun That Luang. 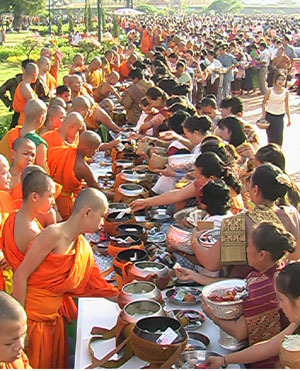 Traditionally, the That Luang festival is held over three-seven days during the full moon of the twelfth lunar month (November). Nowadays, the festival also includes a trade fair which starts a few days prior to the actual festival days. 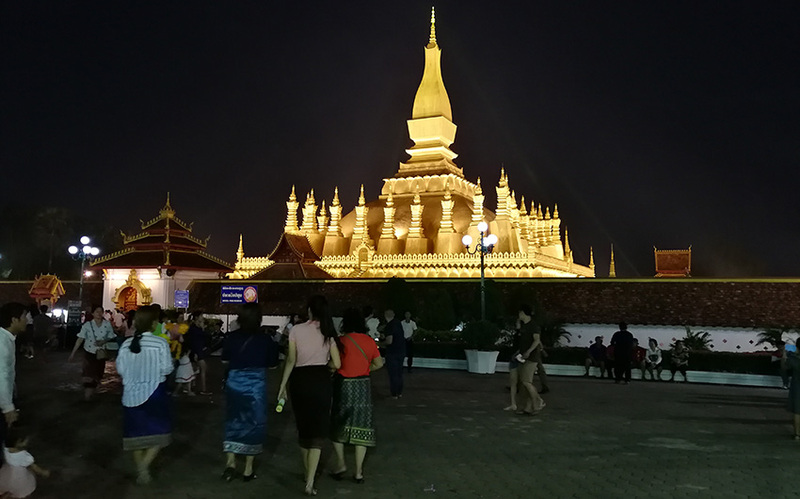 The festival starts with a colorful candlelight ‘wax castle' (phasat ) procession which starts in the evening before at Wat Simeuang, where groups gather and walk three times around the main hall of worship in honor of the Vientiane city pillar, which is located at this temple. 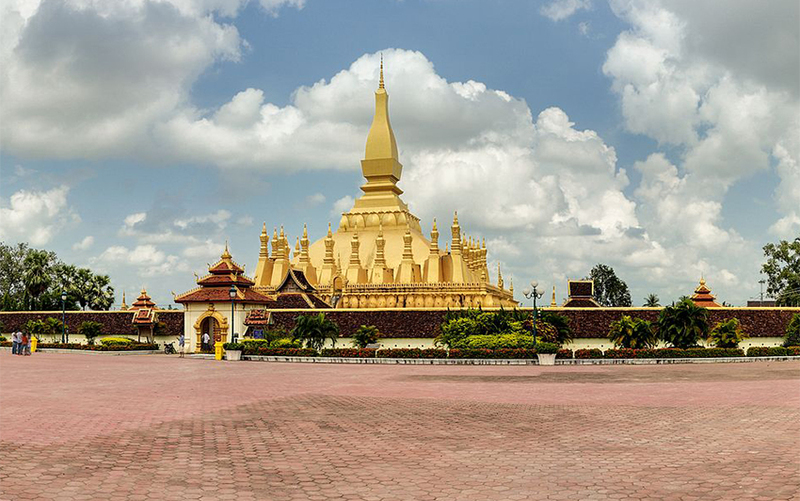 As the home of the city’s founding pillar, the Wat is considered one of the most important in Vientiane. According to legend, when the pillar was laid, a pregnant woman, Nang Si inspired by supernatural forces, threw herself to death under the pillar as it was being dropped into position. Nang Si is now seen as the guardian of the city and every year homage is paid to her and Lord Buddha during the festival. As well as the castles, they carry candles, incense and flowers, beat drums and cymbals and sing as they walk around the Wat. Many Lao living abroad come back to visit their families in Laos during That Luang festival period. I'd also recommend anyone who plans to visit the country to come this time of year. For those interested in Lao culture, it is a good opportunity to observe the culture through Lao festivals.The weather is also nice and cool (no rain), the city, especially Vientiane, is more lively. However, as this is peak time for tourists, hotels are often booked up. It is a good idea to book your hotel in advance. During the alms giving ritual inside the cloister and on the esplanade outside, everyone sits quietly and listens to the prayers. Some people pour water on the ground to ask Ngamae Thorani (a female earth goddess) to tell the spirits of their relatives to come and receive their offerings, while others release birds from cages to make merit. 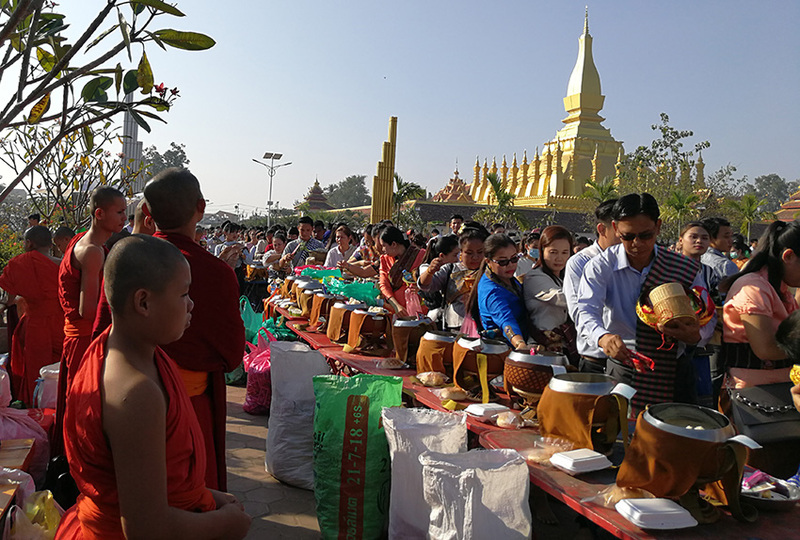 Everyone tries to go inside the stupa when the formal part of the ceremony has ended to give alms to the monks, to light candles and incense and pray for good luck. A traditional picnic follows, when people eat boiled chicken, rice and noodles and catch up with friends and families. In the afternoon, everyone will gather on the esplanade for the traditional game of tikhy, which is played with a ball and long curved sticks, resembling a game of hockey. The game used to be played by two opposing groups, one symbolising the people and the other the establishment. 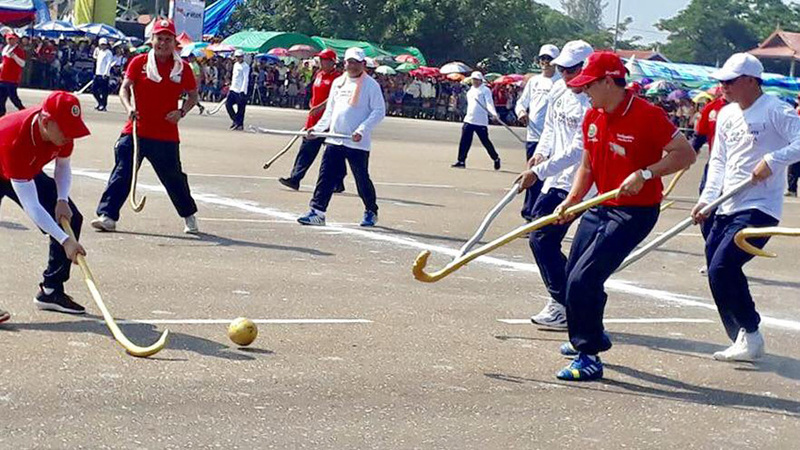 Nowadays, it is considered a more light-hearted sporting event between two teams of the Vientiane municipality. Nevertheless, the procession to accompany the ball (louk khy) from the stupa to the grounds and back.